The DS216+ uses the same operating system and has most of the same features found on all other Synology NASes. Of course, some of the features are hardware dependent and may not be on every model. The current operating system is DSM 5.2.5644 update 5, which we used for our tests. When DSM 5.0 was released last year, I wrote a full review of its features. A list of DSM 5.2's updated features can be found here and can also download the DSM 5.2 User's Guide. The DSM live demo is still on hiatus, perhaps to return when DSM 6.0 exits beta. Synology is preparing to release a major DSM upgrade. DiskStation Manager 6.0 is currently at the "RC" (Release Candidate) stage of development. You can check out all of the new features, or, if you like living on the edge, download it. Synology notes DSM 6.0 RC is For evaluation only and that it's Not downgradeable. Still, the list of new features gives you an idea of what you can look forward to when DSM 6.0 is released. The user interface hasn't changed since the DS716+ review, so I'm including the same two images from that review. For illustration purposes, the on-screen widget that shows CPU and LAN utilization has been enabled. The image below is the Synology Storage Manager. What's really important about this image is the filesystem. Like the DS716+, the DS216+ defaults to the Btrfs filesystem. While most other NASes use the EXT4 filesystem, this is the second Synology product that we've seen that defaults to Btrfs. If you poke around Synology's site, you'll find this white paper that details some of the features and benefits of Btrfs . If you don't want to read the white paper, here's Synology's brief summary of Btrfs. DSM 5.2-5644 update 5 firmware was loaded onto the DS216+ and performance tests were run using the Revision 5 NAS test process. All tests were run using the two Seagate NAS HDD 4 TB ST4000VN000 drives Synology supplied. The test volumes were created using the DS216+'s defaults: Btrfs filesystem for the volumes and Advanced data integrity protection for folders. The composite image below shows File Copy Write and File Copy Read performance for two drive NASes tested with the Revision 5 test process. For File Copy Write, the DS216+ turned in 108.5 MB/s which was slightly lower than the chart-topping 110.5 MB/s. For File Copy Read performance, the DS716+ topped the charts at 109.0 MBps. Note that quite a few NASes in both charts cluster between 109 and 110 MB/s. That's about the maximum throughput that you can achieve with single client Gigabit Ethernet testing. As we have noted in other reviews, performance within 5% of each other is ranked the same. What's important here is the DS216+ is in the top tier and within the 5% tolerance for both tests. For performance comparisons, I'm using the same products that were included in the component summary table above. Both the Synology NASes were tested with the default Btrfs filesystem and the AS5102T was tested with its default EXT4 filesystem. The benchmark summaries below show the individual test results for each of the three selected products. For all three products, the RAID 0 File Copy Write and Read benchmarks were all within a couple of percentage points of each other and near the maximum throughput of a single Gigabit Ethernet client. As noted in the DS716+ review, RAID 1 File Copy Write (74.3 MB/s) and Read (92/3 MB/s) performance was significantly below the other two products, which each turned in scores well above 100 MB/s on both tests. And while all three products also had similar scores for the NASPT File Copy to NAS and NASPT File Copy from NAS for RAID 0, the DS716+ again had significantly poorer performance than the other two products on both NASPT File Copy tests for RAID 1. The DS716+ lacks USB 2.0 ports, so USB Backup results were reported for only for USB 3.0 for all three supported file types. Both of the DS216+ and the AS5102T have USB 2.0 and USB 3.0 ports so results were reported for both interfaces. The backup tests results are pretty easy to summarize. The ASUSTOR AS5102T out-performed both of the Synology NASes on every test. Similarily the DS216+ outperformed the DS716+ on every test. It is our standard practice to perform iSCSI tests using either RAID1 or RAID5 volumes, not RAID 0. So the lower iSCSI results for the two Synologies could be due to Btrfs overhead. The composite NAS Ranker chart below was filtered for RAID1 and Revision 5 testing and sorted by ascending price. The DS216+, priced at $300 is a real bargain compared to the #1 ranked AS5201T at $416 and an even better bargain as compared to its more expensive ($450) sibling, the #12 ranked DS716+. The chart below shows the individual and category scores for the same three NASes used in the benchmark summary above. The Synology DS216+ had three category wins (Write benchmarks, Video and Mixed Read Write) and ended up ranked #2 for Total NAS. Based on the benchmark summaries above, it's no surprise that the AS5102T easily won the categories for Backup, iSCSI and Read Benchmarks. With a street price of about $300, the Synology DS216+ offers a lot of bang for the buck. It's ranked #2 behind the ASUSTOR AS5102T which costs $116 more. If you look carefully at the benchmark summaries and ranker performance category rankings, you'll see that there is only a small amount of difference between the two. While there are seven NASes that are less expensive, none of them perform as well as the DS216+. 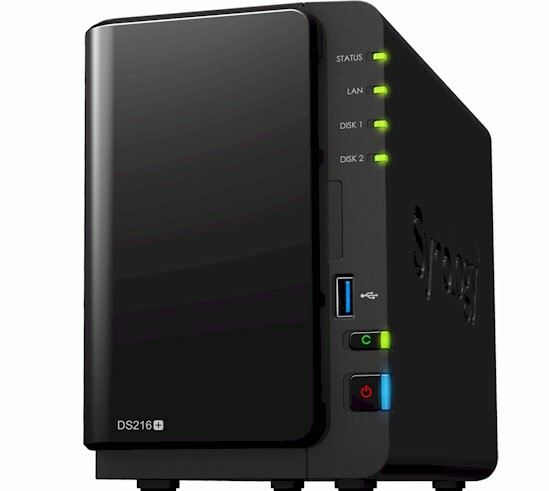 The next closest, cheaper model is the #4 ranked $270 Synology DS216. But if you compare the features, the DS216+ has a faster 64-bit processor compared to the DS216's 32-bit processor. If video transcoding is important to you, the DS216+ features a 4K hardware transcoding engine, not found on the DS216. The DS216+ also supports Btrfs, and therefore Btrfs snapshots. The $30 premium that you pay for the DS216+ compared to the DS216 is well worth it. For now, the ASUSTOR AS5102T keeps its #1 ranking based on performance, and the $293 Western Digital My Cloud Gen 2 (with two 2 TB disks included) remains the best overall storage value for a two-bay NAS. But Synology is going to sell a lot of DS216+es to value-conscious buyers looking for lots of features and great performance.